For other uses, see Wake Island (disambiguation). 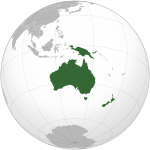 /ˈweɪk/; also known as Wake Atoll) is a coral atoll having a coastline of 12 miles (19 km) in the North Pacific Ocean, located about two-thirds of the way between Honolulu, 2,300 statute miles (3,700 km) to the east, and Guam, 1,510 statute miles (2,430 km) to the west. It is an unorganized, unincorporated territory of the United States, administered by the Office of Insular Affairs, U.S. Department of the Interior. Access to the island is restricted, and all activities on the island are managed by the United States Air Force. There is also a missile facility operated by the United States Army. 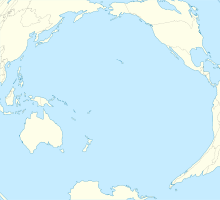 The largest island, Wake Island, is the center of activity on the atoll and is the location of Wake Island Airfield (IATA: AWK, ICAO: PWAK), which has a 9,800-foot (3,000 m) runway. On January 6, 2009, President George W. Bush included the atoll as a part of the Pacific Remote Islands Marine National Monument. For statistical purposes, Wake is grouped as one of the United States Minor Outlying Islands. Wake is located to the west of the International Date Line and sits in the Wake Island Time Zone, one day ahead of the 50 U.S. states. Referring to the atoll as an island is the result of a pre-World War II desire by the United States Navy to distinguish Wake from other atolls, most of which were Japanese territory. Wake Island lies in the tropical zone, but it is subject to periodic temperate storms during the winter. Sea surface temperatures are warm all year long, reaching above 80 °F (27 °C) in summer and autumn. Typhoons occasionally pass over the island. On September 16, 1967, at 10:40 pm local time, the eye of Typhoon Sarah passed over the island. Sustained winds in the eyewall were 130 knots (241 km/h), from the north before the eye, and from the south afterward. All non-reinforced structures were demolished. There were no serious injuries, and the population was evacuated after the storm. On August 28, 2006, the United States Air Force evacuated all 188 residents and suspended all operations as category 5 Super Typhoon Ioke headed toward Wake. By August 31, the southwestern eyewall of the storm passed over the island, with winds well over 185 miles per hour (298 km/h), driving a 20 ft (6 m) storm surge and waves directly into the lagoon inflicting major damage. A US Air Force assessment and repair team returned to the island in September 2006 and restored limited function to the airfield and facilities leading ultimately to a full return to normal operations. Indigenous Marshallese oral tradition suggests that prior to European exploration, nearby Marshall Islanders traveled to what is now Wake Island, which the travelers called Enen-kio (Marshallese: Ānen-kio, Template:IPAc-mh) after a small orange shrub-flower said to have been found on the atoll. In the ancient Marshallese religion, rituals surrounding the tattooing of tribal chiefs, called Iroijlaplap, were done using fresh human bones, which required a human sacrifice. A man could save himself from being sacrificed if he obtained a wing bone from a very large seabird said to have existed on Enen-kio. Small groups would brave traveling to the atoll in hopes of obtaining this bone, saving the life of the potential human sacrifice. No evidence exists to suggest there was ever a permanent settlement by Marshall Islanders on Wake Island. Based upon oral tradition, along with concepts of first-usage land rights commonly held in Micronesian cultures as legitimate for settling indigenous land disputes, a group of Marshall Island descendants formed the Kingdom of EnenKio to claim ownership of Wake Island. The Marshall Islands and U.S. governments, who have competing claims to the island, vigorously deny this. On October 20, 1568, Álvaro de Mendaña de Neyra, a Spanish explorer with two ships, Los Reyes and Todos Santos, discovered "a low barren island, judged to be eight leagues in circumference", to which he gave the name of "San Francisco". The island was eventually named for Captain William Wake, master of the British trading schooner, Prince William Henry, who visited in 1796. Jeremiah N. Reynolds' 1828 report to the US House of Representatives describes Capt. Edward Gardner's discovery of a 25-mile (40 km) long island situated at 19°15' N, 166°32' E, with a reef at the eastern edge when he was captain of the HMS Bellona in 1823. The island was "covered with wood, having a very green and rural appearance" and, Reynolds concluded, was probably Wake Island. It was placed on charts by John Arrowsmith. On December 20, 1840, the United States Exploring Expedition, commanded by Commodore Charles Wilkes of the U.S. Navy, landed on Wake and surveyed the island. Wilkes described the atoll as "a low coral one, of triangular form and eight feet above the surface. It has a large lagoon in the centre, which was well filled with fish of a variety of species among these were some fine mullet." He also noted that Wake had no fresh water but was covered with shrubs, "the most abundant of which was the tournefortia." The expedition's naturalist, Titian Peale, collected many new specimens, including an egg from a short-tailed albatross and various marine life specimens. Wake Island first received international attention with the wreck of the barque Libelle. On the night of March 4, 1866, the 650 ton Libelle, of Bremen, Germany, struck the eastern reef of Wake Island during a gale. Commanded by Captain Tobias, the ship was en route from San Francisco to Hong Kong. Among its passengers were the English-born opera singer Anna Bishop (this occurred on the first leg of a world tour), her second husband Martin Schultz (a New York diamond merchant), and three other members of an English opera troupe. After 21 days on Wake, the 30 stranded passengers and crewmen sailed in a longboat and the gig for the then Spanish island of Guam. The longboat, containing the opera troupe, Mr. Schultz and other passengers, reached Guam on April 8. Unfortunately, the gig, commanded by the captain, was lost at sea. Captain Tobias had buried valuable cargo on Wake, including 1,000 flasks (34,500 kg) of mercury, as well as coins and precious stones worth about US$150,000. At least five ships conducted salvage operations for its recovery. The plight of the Libelle's passengers and the buried cargo was reported by newspapers around the world. Wake Island was annexed as empty territory by the United States on January 17, 1899, as a planned telegraph cable station. A major air and naval base was built in 1940-41. In 1935, Pan American Airways constructed a small village, nicknamed "PAAville", to service flights on its U.S.–China route. The village was the first human settlement on the island, and relied upon the U.S. mainland for much of its food and water supplies. However, Wake Island is credited as being one of the early successes of hydroponics, which enabled Pan American Airways to grow vegetables for its passengers, as it was prohibitively expensive to airlift in fresh vegetables and the island lacked natural soil. PAAville remained in operation up to the day of the first Japanese air raid in World War II. In January 1941, the United States Navy constructed a military base on the atoll. On August 19, the first permanent military garrison, elements of the 1st Marine Defense Battalion, totaling 449 officers and men, were stationed on the island, commanded by Navy Commander Winfield Scott Cunningham. Also on the island were 68 U.S. Naval personnel and about 1,221 civilian workers. They were armed with six used 5 inch/51 cal (127 mm) cannons, removed from a scrapped battleship; twelve 3 inch/50 cal (76.2 mm) M3 anti-aircraft guns (with only a single working anti-aircraft director among them); eighteen Browning M2 .50 caliber heavy machine guns; and thirty heavy, medium, and light, water or air-cooled Browning M1917 .30 caliber machine guns in various conditions but all operational. The formal surrender of the Japanese garrison on Wake Island – September 7, 1945. Shigematsu Sakaibara is the Japanese officer in the right-foreground. On December 8, 1941, the day of the Attack on Pearl Harbor (December 7 in Hawaii, which is on the other side of the International Date Line), at least 27 Japanese Mitsubishi G3M medium "Nell" bombers flown from bases on Kwajalein in the Marshall Islands attacked Wake Island, destroying eight of the 12 F4F Wildcat fighter aircraft belonging to United States Marine Corps Fighter Squadron 211 (VMF-211) on the ground. The Marine garrison's defensive emplacements were left intact by the raid, which primarily targeted the aircraft. The garrison – supplemented by civilian volunteers – repelled several Japanese landing attempts. An American journalist reported that after the initial Japanese amphibious assault was beaten back with heavy losses on December 11, the American commander was asked by his superiors if he needed anything. The commander sent back the message, "Send us more Japs!" – a reply which became a popular legend. However, when Major James Devereux, USMC, learned after the war that he was credited with that message, he pointed out that contrary to reports he was not the commander on Wake Island and denied sending that message. "As far as I know, it wasn't sent at all. None of us was that much of a damn fool. We already had more Japs than we could handle." In reality, Commander Winfield S. Cunningham, USN, was in overall charge of Wake Island, not Devereux. Cunningham ordered that coded messages be sent during operations, and a junior officer had added "send us" and "more Japs" to the beginning and end of a message to confuse Japanese code breakers. This was put together at Pearl Harbor and passed on as part of the message. Cunningham and Deveraux both wrote books about the battle and their Japanese imprisonment ordeal. Denied support from Hawaii, the isolated U.S. garrison was eventually overwhelmed by a reinforced and greatly superior Japanese invasion force on December 23. American casualties numbered 52 military personnel (Navy and Marine) and approximately 70 civilians killed. Japanese losses exceeded 700 dead, with some estimates ranging as high as 1,000. Wake's defenders sank two Japanese destroyers and one submarine, and shot down 24 Japanese aircraft. Captain Henry T. Elrod, USMC, one of the pilots from VMF-211, was awarded the Medal of Honor posthumously for shooting down two Japanese Zero fighters, sinking a destroyer and later fighting on foot, when his plane was destroyed, to defend the island. Many of his comrades were also highly decorated for their part in the fighting. The Wake Island Device was created for American veterans of the battle to wear on their Navy or Marine Corps Expeditionary Medals. The island's Japanese garrison was composed of the IJN 65th Guard Unit (2,000 men), Japan Navy Captain Shigematsu Sakaibara and the IJA units which became 13th Independent Mixed Regiment (1,939 men) under command of Colonel Shigeji Chikamori. The Japanese-occupied island (called by them Otori-Shima or "Bird Island" for its birdlike shape) was bombed several times by American aircraft; one of these raids was the first mission for future United States President George H. W. Bush. After a successful American air raid on October 5, 1943, Sakaibara ordered the execution of all of the 98 captured Americans who remained on the island. They were taken to the northern end of the island, blindfolded, and machine-gunned. One prisoner escaped, carving the message "98 US PW 5-10-43" on a large coral rock near where the victims had been hastily buried in a mass grave. This unknown American was soon recaptured and beheaded. Sakaibara and his subordinate, Lieutenant Commander Tachibana, were later sentenced to death after conviction for this and other war crimes. Tachibana's sentence was later commuted to life in prison. The remains of the murdered civilians were exhumed and reburied at the National Memorial Cemetery of the Pacific in section G.
On September 4, 1945, the Japanese garrison surrendered to a detachment of United States Marines. The handover of Wake was conducted in a brief ceremony. 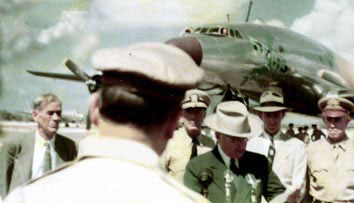 President Harry S. Truman reads citation to General Douglas MacArthur following their meeting at Wake Island. In the background are from left: Press Secretary Charles Griffith Ross, Commander in Chief Pacific Admiral Arthur Radford, Secretary of the Army Frank Pace, and Chairman of the Joint Chiefs General Omar Bradley. October 15, 1950. On 15 October 1950 U.S. President Harry S. Truman and General Douglas MacArthur met on Wake Island (Wake Island Conference) to confer about the progress of the Korean War. They chose to meet at Wake Island because of its closer proximity to Korea so that General MacArthur would not have to be away from the troops in the field for long. Subsequently the island was used for strategic defense and operations during the Cold War. In 1952 or 1953, a young Kris Kristofferson worked for a dredging contractor on the island. It was administered by the United States Army Space and Missile Defense Command (formerly known as the United States Army Space and Strategic Defense Command). Since 1974, Wake Island has served as a launch platform for military rockets involved in testing anti-missile systems and atmospheric re-entry trials. Launches take place from 19°17′24″N 166°37′05″E﻿ / ﻿19.29, 166.61806. In conjunction with the aerospace use, the island's airstrip, Wake Island Airfield, has been used by the U.S. military and some commercial cargo planes, as well as for emergency landings. There are over 700 landings of all types a year on the island. There are also two offshore anchorages for large ships. From late April until the middle of August 1975, Wake Island was used as a refugee camp for more than 8,000 Vietnamese refugees who fled their homeland after the fall of Saigon ended the Vietnam War with a communist victory. The island remains a strategic location in the North Pacific Ocean and serves as an emergency landing location for twin-engined ETOPS commercial transpacific flights passing overhead. Some World War II facilities and wreckage remain on the island. On September 16, 1985, the World War II–related resources on Peale, Wilkes, and Wake Islands were designated a National Historic Landmark Preserving the remains of World War II items from the Battle of Wake Island was the goal of the designation. (and thereby also listed on the National Register of Historic Places). On January 16, 2009, Secretary of the Interior Dirk Kempthorne created Wake Island National Wildlife Refuge in consultation with the Air Force. The Refuge covers a total of 495,515 acres (2,005.278 km2), nearly all of which is submerged lands within 12 nautical miles (22 km) of the island. Under the Refuge a rare grass species, Lepturus gasparricensis, is protected and both the black footed and laysan albatrosses have been reintroduced. However the one species endemic to Wake Island, the Wake Island Rail, became extinct between 1942 and 1945 as a result of hunting for food by the large contingent of occupying Japanese troops. On January 6, 2009, President George W. Bush included the atoll as a part of the Pacific Remote Islands Marine National Monument. 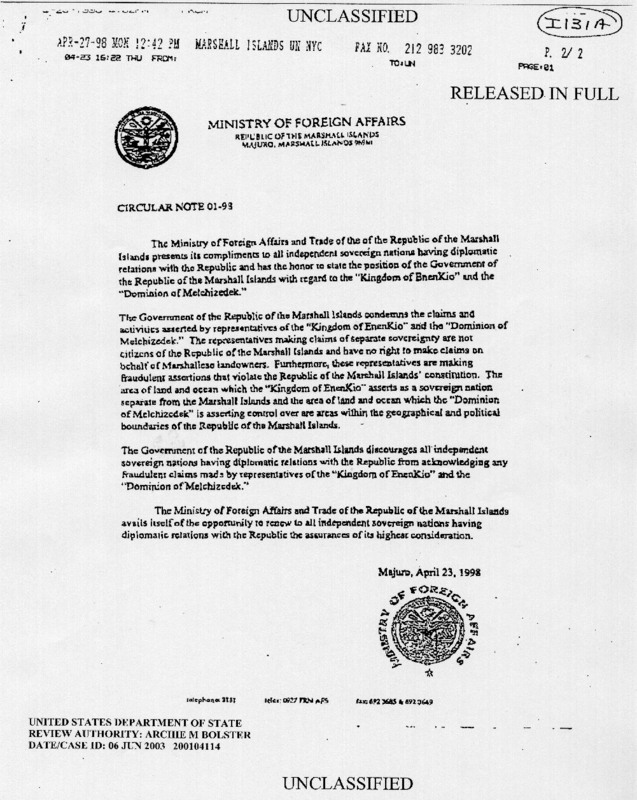 The territorial claim by the Republic of the Marshall Islands on Wake Atoll leaves a certain amount of ambiguity regarding the actual or hypothetical role of the U.S. military, responsible under agreement for the defense of Marshallese territory in the event of any strategic crisis or hostilities involving Wake. A small separatist group is known as the Kingdom of EnenKio also claims the island. However, the atoll was formally annexed by the United States at the end of the 19th century and is still administered by the U.S. Department of the Interior's Office of Insular Affairs. Wake Island is a recurring map in the Battlefield first-person shooter series. It appears in Battlefield 1942, Battlefield 2, Battlefield 2142, Battlefield Heroes, Battlefield 1943 and Battlefield 3, as a principal game map. ^ a b "Presidential Proclamation 8336" (PDF). http://www.fws.gov/pacificremoteislandsmarinemonument/PP%20PRIMNM.pdf. Retrieved 2011-12-10. ^ "Weekly Compilation of Presidential Documents: Monday, January 12, 2009 Volume 45 – Number 1, Page 14". Fdsys.gpo.gov. http://fdsys.gpo.gov/fdsys/pkg/WCPD-2009-01-12/pdf/WCPD-2009-01-12.pdf. Retrieved 2011-12-10. ^ "NOAA The 1967 Central Pacific Tropical Cyclone Season". Prh.noaa.gov. 2007-05-04. http://www.prh.noaa.gov/cphc/summaries/1967.php. Retrieved 2011-12-10. ^ "'Super' Typhoon Slams Tiny Wake Island". Fox News. September 1, 2006. http://www.foxnews.com/story/0,2933,211537,00.html. ^ "Wake Island". Janeresture.com. http://www.janeresture.com/wake/index.htm. Retrieved 2011-12-10. ^ "Reynold's Report to the House of Representatives". Mysite.du.edu. http://mysite.du.edu/~ttyler/ploughboy/usexex573.htm. Retrieved 2011-12-10. ^ Rongxing Guo (2006). Territorial Disputes and Resource Management: A Global Handbook. Nova Publishers. p. 255. http://books.google.com/books?id=z5Le627xQLgC&pg=PA255. ^ Taylor, Frank J. (Jul 1939). "Nice Clean Gardening". The Rotarian: 14–15. ^ Melson, Major Charles D. "The Approach of War". CONDITION RED: Marine Defense Battalions in World War II. United States Marine Corps History Division. http://www.nps.gov/history/history/online_books/npswapa/extcontent/usmc/pcn-190-003133-00/sec12.htm. Retrieved 13 September 2010. ^ L, Klemen (1999–2000). "Chronology of the Dutch East Indies, December 1941". Forgotten Campaign: The Dutch East Indies Campaign 1941–1942. http://www.dutcheastindies.webs.com/december2.html. ^ "Legends". Usmilitary.about.com. 1941-12-07. http://usmilitary.about.com/od/marines/a/legends.htm. Retrieved 2011-12-10. ^ "Joyous Finale". Time. 1945-09-17. http://www.time.com/time/magazine/article/0,9171,854451,00.html. Retrieved 2007-04-08. ^ Boller, Jr., Paul F.; George, John (1989). They Never Said It: A Book of Fake Quotes, Misquotes, and Misleading Attributions. New York: Oxford University Press. ISBN 0-19-505541-1. ^ Yaklitch, Mike; Alsleben, Allan; Takizawa, Akira (1999–2000). "Japanese Special Naval Landing Forces". Forgotten Campaign: The Dutch East Indies Campaign 1941–1942. http://www.dutcheastindies.webs.com/SNLF.html. ^ Takizawa, Akira; Alsleben, Allan (1999–2000). "Japanese garrisons on the by-passed Pacific Islands 1944–1945". Forgotten Campaign: The Dutch East Indies Campaign 1941–1942. http://www.dutcheastindies.webs.com/japan_garrison.html. ^ Parmet, Herbert S (2001). George Bush: The Life of a Lone Star Yankee. ISBN 978-0-7658-0730-4. http://books.google.com/?id=M7CqPV_wHKgC&pg=PA51&lpg=PA51&dq=george+bush+wake+island#v=onepage&q=george%20bush%20wake%20island&f=false. ^ Major Mark E. Hubbs, U.S. Army Reserve (Retired). "Massacre on Wake Island". http://www.yorktownsailor.com/yorktown/massacre.html. Retrieved 18 February 2011. ^ Harry S. Truman Museum & Library. "Special Counsel to the President Charles Murphy". Trumanlibrary.org. http://www.trumanlibrary.org/wake/. Retrieved 2011-12-10. ^ "Wake Island 1975". Wake Island 1975. http://www.wakeisland1975.com/. Retrieved 2011-12-10. ^ "Wake Island". National Historic Landmark summary listing. National Park Service. http://tps.cr.nps.gov/nhl/detail.cfm?ResourceId=4&ResourceType=Building. Retrieved 2007-10-02. ^ White, Susan (2011-08-26). "Wake Atoll National Wildlife Refuge Management". Retrieved on 2012-03-04. ^ White, Susan (2011-03-30). "Wake Atoll National Wildlife Refuge". Retrieved on 2012-03-11. ^ (2010-03-18) "Wake Island National Wildlife Refuge Wildlife and Habitat". Retrieved on 2012-03-11. ^ "From execution site to gaming icon: the story of Wake Island". http://arstechnica.com/gaming/news/2011/05/wake-island-feature.ars. Retrieved 3 April 2012. Drechsler, Bernd; Begerow, Thomas; Pawlik, Peter-Michael (2007) (in German). Den Tod vor Augen : die unglückliche Reise der Bremer Bark Libelle in den Jahren 1864 bis 1866. Bremen: Hauschild. ISBN 978-3-89757-333-8. (1971) "Enen-kio: Island of the Kio Flower". Micronesian Reporter 14 (4): 34–37. ISSN 0026-2781. L, Klemen (1999–2000). "Forgotten Campaign: The Dutch East Indies Campaign 1941–1942". http://www.dutcheastindies.webs.com/index.html. This page uses content from the English language Wikipedia. The original content was at Wake Island. The list of authors can be seen in the page history. As with this Familypedia wiki, the content of Wikipedia is available under the Creative Commons License.